The split of the Swedish Doom / Stoner band NORRSKEN in 2000 marked the foundation of two new bands. While a remaining of the band built WITCHCRAFT, the rest of them was going to start something really rare, clearly unique, with an honest, acoustic sense, that is now known as the graveyard. A band that knows no borders and no limitations at all. Their unique sound, which includes all rock styles, pulls GRAVEYARD out of the masses. Classic rock, blues, jazz, folk - no matter how you call it - the quartet always sounds authentic. With their big influence of very different genres, GRAVEYARD always remain at the top of what they do - give the listener a wide range of emotions, moods and feelings. Black Sabbath meets Rolling Stones, Led Zeppelin meets Janis Joplin ... it could go on longer and longer... 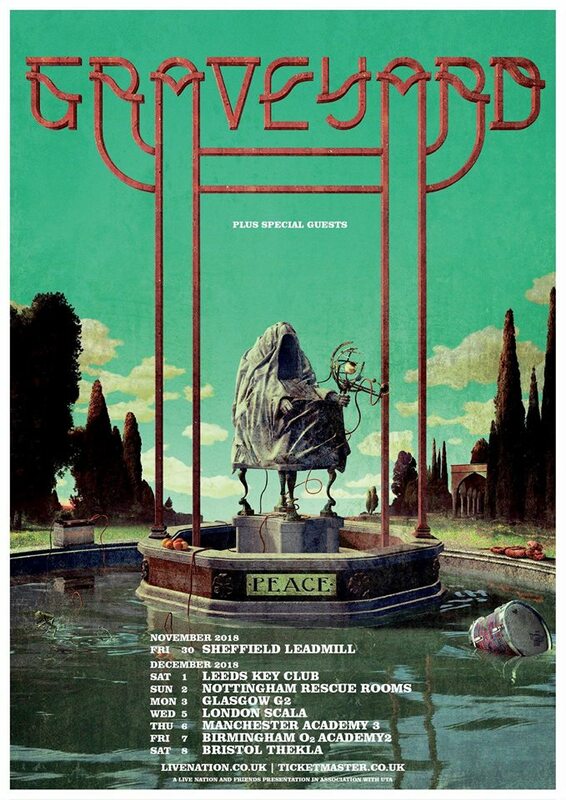 If some other bands are considered only for their neo-satanistic attitude or are interested in the rebirth of the old school, GRAVEYARD plays breathtaking melodies, that bring us to a trip into a lost century of true musicality. After the success of "Hisingen Blues" in 2011, their debut-album "Graveyard" was re-released in the same year. Just one year later, and the following album "Lights Out" came out, reflecting perfectly the versatility of their songwriting. This album, full of social criticism, is infused with Joakim Nilsson's skills and the beauty of Jonatan Ramm's riffs. The band is set to release their fourth full-lenght album ''Innocence & Decadence'' in September 2015 worldwide. This new effort has been recorded in the Atlantis Studios in Stockholm (Sweden) alongside both Janne Hansson and Johan Lindström.